This brightly colored, conspicuously patterned rodent averages 243 mm (9.6 in) in length. A rusty rump, two buffy to whitish eye stripes, and narrow dark brown to blackish stripes on the back and sides-the lower two on each side bordering a white or buffy white stripe-distinguish the “grinny” or ”ground hackee” (two colloquial names). The grizzled tan upper parts and buffy white under parts are additional characters. The tail, about 93 mm (3.7 in) in length, is moderately furred and slightly flattened. Adults weigh about 80-92 g (2.8-3.2 oz). The eastern chipmunk spends most of the winter in its burrow. This inactive phase extends from about mid November until early March – late April, with local snow depth and temperatures influencing the duration. This species is not a true hibernator and accumulates little body fat prior to winter. Underground caches of food are sources of energy for individuals arousing from short, recurring periods of torpor. 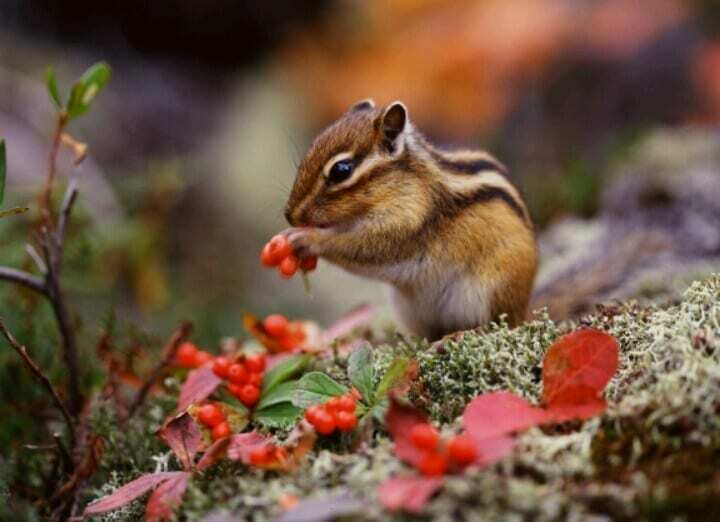 During mid-winter thaws, some chipmunks may leave their burrows, even digging through several feet of snow to forage for seeds in nearby areas where the snow has melted, exposing the forest floor. Chipmunks residing at low elevation and near bird feeding stations in yards may come above the ground throughout the winter to consume sunflower seeds. At all seasons, chipmunks are diurnal, i.e., leaving their burrows only during day light. They are least active during hot, windy, or rainy weather, and during some years, may seldom venture from their burrows in July and August, a response to scarce food and botfly parasitism rather than hot temperatures.